I am going to compete in the World Food Championships in Las Vegas all thanks to winning the Dixie Crystals Brownie Dessert Contest. 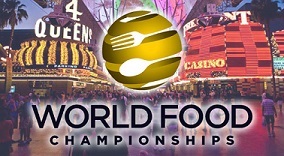 The World Food Championships will take place in Downtown Las Vegas at the Fremont Street Experience, November 7 through 10, 2013. This competition is serious. People compete and travel all year round to competitions like this. People train for months at a time and spend exorbitant amounts of money in order to win. Some entered contests and won thousands of dollars in addition to a berth at this competition. Some have entered contest after contest after contest and they are HUNGRY. Salivating. Ready to get to Vegas and compete. And I'm going up against 49 of these people. I have kicked off a crowdfunding campaign at Indiegogo.com. I have ONE week left to raise $2,600. I'm over the halfway point and I need an extra push to take me all of the way. Please contribute! Every dollar counts. Even if it's $1, I need your support. Whether you support me with your dollars, your kind words or your social media and email promotions, I accept all things good and positive to send me to Las Vegas in November. I'm currently looking for all kinds of sponsorships (monetary and equipment) so if you, someone you know or a company willing to take a chance on projects like mine, let me know!